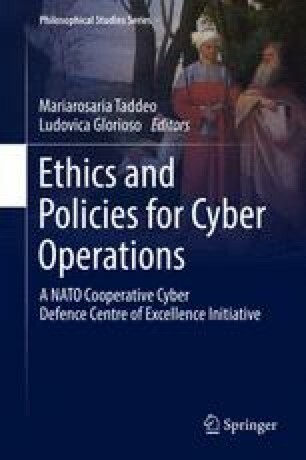 In this chapter I propose an ethical analysis of information warfare, the warfare waged in the cyber domain. The goal is twofold, filling the theoretical vacuum surrounding this phenomenon and providing the conceptual grounding for the definition of new ethical regulations for information warfare. I argue that Just War Theory is a necessary but not sufficient instrument for considering the ethical implications of information warfare and that a suitable ethical analysis of this kind of warfare is developed when Just War Theory is merged with Information Ethics. In the initial part of the chapter, I describe information warfare and its main features and highlight the problems that arise when Just War Theory is endorsed as a means of addressing ethical problems engendered by this kind of warfare. In the final part, I introduce the main aspects of Information Ethics and define three principles for a just information warfare resulting from the integration of Just War Theory and Information Ethics. Dipert, R. 2013. The essential features of an ontology for cyberwarfare. In Conflict and cooperation in cyberspace, ed. Panayotis Yannakogeorgos and Adam Lowther, 35–48. Boca Raton: Taylor & Francis. http://www.crcnetbase.com/doi/abs/10.1201/b15253-7. Floridi, L. 2006. Information ethics, its nature and scope. SIGCAS Comput. Soc. 36(3): 21–36. doi: 10.1145/1195716.1195719. Floridi, L. 2008. The method of levels of abstraction. Minds and Machines 18(3):303–329. doi: 10.1007/s11023-008-9113-7. “ICRC Databases on International Humanitarian Law.” 00:00:00.0. http://www.icrc.org/ihl/INTRO/470. Schmitt, M.N. 1999. The principle of discrimination in 21st century warfare. SSRN Scholarly Paper ID 1600631. Rochester: Social Science Research Network. http://papers.ssrn.com/abstract=1600631.